Download My Little Pony: The Movie in Digital HD from the iTunes store. My Little Pony: The Movie images are © Lionsgate. All Rights Reserved. In 1986 Hasbro toys decided to make a television series based on one of their popular toys – My Little Pony. The show lasted two seasons but merchandising continued to sell for some years after. Then in 1992, we got another version called My Little Pony Tales that had 26 episodes. Almost 20 years later My Little Pony: Friendship is Magic premiered on the Hub Network and has continued to run for seven years. 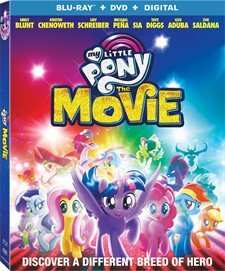 In 2017 we got My Little Pony: The Movie, which is now set to be released on Blu-ray, DVD and Digital Download this week. As the film opens we see Princess Twilight Sparkle (Tara Strong; The Powerpuff Girls) preparing for Equestria's first Friendship festival. She and the other ponies are nervous and excited but as they decorate the town a dark cloud movies in. It turns out to be The Storm King's (Live Schrieber; Spotlight) henchmen who have come to trap the four Princesses and harness their power to use for the Storm King's evil ways. When Twilight Sparkle escapes, Tempest (Emily Blunt; The Devil Wears Prada) tracks her down to bring her back to Equestia. Twilight has gone on a journey with other ponies to find the "Hippo queen" and ask for her help. Along the journey, Twilight and her friends meet all sorts of characters including Capper (Taye Diggs; Rent), Captain Celaeno (Zoe Saldana; Star Trek Beyond) and Princess Skystar (Kristin Chenoweth; RV) and her mother, Queen Novo (Uzo Aduba; Orange is the New Black), who is the Queen of the Hippolytus – a pony colony that Twilight seeks out for help. Eventually Twilight angers her friends, get captured and is returned to Equestria to complete The Storm King's evil plan. Luckily, Twilights friends forgive her and save her and the town. The voice talent in this film is incredibly strong with veteran voice actors and the aforementioned cast. Strong is well cast as is Blunt and Chenoweth brings her bubbly personality to Princess Skystar. Schrieber, however, doesn't really fit for me as the menacing Storm King. 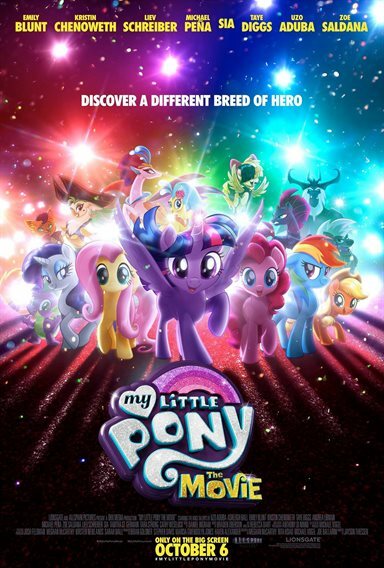 Ashleigh Ball (Littlest Pet Shop), Michael Pena; (CHiPs) and Andrea Libman (Strawberry Shortcake's Berry Bitty Adventures) are just some of the supporting cast members that help bring the story to life with the latter playing a terrifically bubbly Pinkie Pie. The level of talented actors who signed on for this film pleasantly surprised me. The 1080p high definition video quality is strong and the colors pop off the screen beautifully. The animation is somewhat better than the television series but doesn't really match the level of many of the Disney/Pixar/Illumination Studios movies out there. However, that may have been done on purpose as to give the feel of the 1986 show that we loved. The DTS-HD Master Audio 5.1however is superb and the sound effects fill all the channels offering the viewer a fully immersive experience. The Blu-ray, DVD, Digital combo pack has a surprising number of extras for an animated feature. These include: Deleted Scene, Equestria Girls Short, Baking with Pinkie Pie, Making Magic with the Mane 6 and Their New Friends, The Journey Beyond Equestria, I'm the Friend You Need - Music Video and Hanazuki: Full of Treasures. For the right audience, namely 3-7 year-old girls - this is a cute film that will delight them. However looking at the movie from adult eyes, I felt I was witnessing an elongated Saturday morning cartoon. Perhaps that was the idea and, if so, the producers succeeded. It's not a bad film but there are other animated movies that far surpass this one. However, I'm sure the ultimate goal of this movie is to sell more toys and I have no doubt it obtains its goal.